In Windows 10, click the windows logo in the bottom-left corner of the page and then click "settings". Then click "Network & Internet" and follow the instructions. In Windows Vista, 7 and 8. First, go to "Start Menu" -> "Control Panel" -> "Network and Internet". 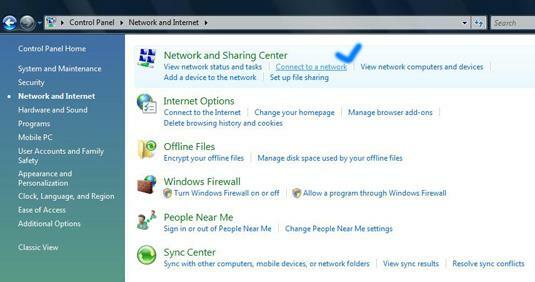 Now... go to "Network and Sharing Center" and select "Connect to a network", like it is shown in the above screenshot. Choose "Show All" and hit the refresh button. If you find active network connections, select the one you want, click on "Connect" and don't forget to check the option that says "Start this connection automatically". 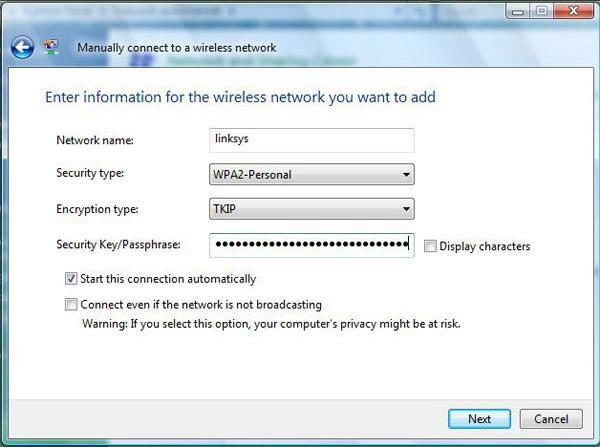 If you check this option, Windows Vista will connect automatically to the selected network every time you log in. 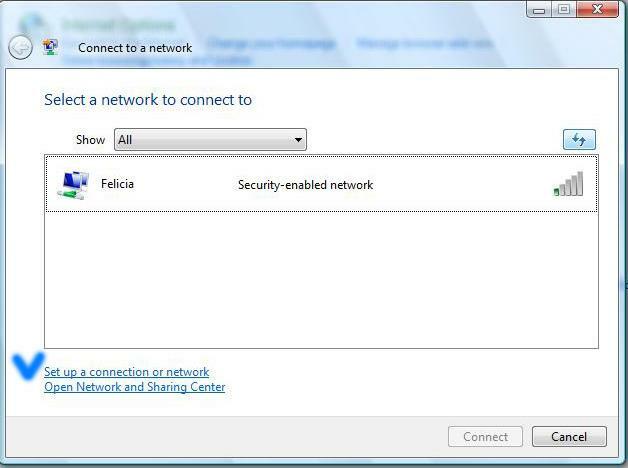 In the “Connect to a network” window, click on “Set up a connection or network”, like shown in the above screenshot. Select “Manually connect to a wireless network” and press the “Next” button. First, enter the “Network name”. In some cases the network name is identical to the name of the router - for example, my router is a Linksys, so the name of the network is Linksys. Choose the security type and the encryption you use on your network. Now type the security key and check the option "Start this connection automatically". Click the "Next" button, then click "Connect to..." and that should be all. You successfully configured a connection to a wireless network. I have gone through all these steps but am still unable to connect wirelessly It is coming up that my wlan is disconnected but my switch is saying its enabled What am I doing wrong ? Did you enter the security key? In order for others to help you, you should describe exactly what you did, what network configuration you have and so on. If you don't give too many details, its less likely that somebody will be able to help. I had the same problem so what i done was, i started from scratch. Disconnected the router resetting it first. I then reinstalled it writing down everything that i inputed, ie user name, password etc etc. I have the same router an ACER 5610 laptop only 4 weeks old. I had exactly the same problem as you did, so here's what i done and it work ok.
Once that is done it should (like mine) tell you that it has CONNECTED SUCCESSFULLY TO NETGEAR. my friend has a acer laptop and has brought a netgear router they cannot get it to go on the internet it just says not conected but it is? also we dont no what cables need to go into the laptop and back off router, as the computoris'nt picking up the router its getting to be a pain could you pleae help me. my problem is that I can connect to the router but not to the internet. can somebody please tell me what might be the problem and how to fix it? If you can connect to your router or modem individually, but not through both at once, you likely just need to powercycle both your modem and router. Unplug each of them, wait about 10 seconds, and plug in your modem. Wait for all the modem's lights to come on, and then plug in your router as well. If you still can't get online, check that your router isn't set to use Static IP when you should be using DHCP, or vice-versa. I show a connection from the radio icon in the tray/taskbar, connected at 38.0 Mbps. I click on IE 7, can not connect to the internet. I've tried Mozilla Firefox 2.0.0.6 and again, can not connect to the internet. I have changed the Connections settings in both browsers to any and all options (Auto-detect proxy, etc.) with no luck. Any thoughts on what my issue might be? You should review your network connection settings (IP Address, subnet, etc) and also the way the Linksys router is configured. Your problem has nothing to do with IE 7 or Firefox. hi i got a new netgear WGR614 wireless router about 3 weeks ago n i have been stuck with it....my laptop(acer 5570Z-about months old) is connecting to the router but not to the internet....i must add that the internet explorer of my laptop doesn't work but firefox does....also i m in community housing and everybody around me says that it should connect quite easily but i don't know whats wrong....perhaps something with vista configurations???? I have a new HP computer running Vista. I have moved into a house that has a wireless router - the router is another room - I get a good signal to the router, says I have a strong internet and local connection. I can get onto programs like limewire (although the connection is sketchy) and very occassionally can connect to a webpage, but as soon as I try to proceed from one page to the next it says I have connection problems - but when I trouble shoot, it says the connection is fine - aarrggh! Problem: Can not connect to the wireless network. My daughter has a Toshiba satellite laptop that came loaded with Vista. When she first turned the laptop on it connected to our LInksys Wireless router and out through the ISP Netgear router with no problems. Yesterday, out of nowhere, it cannot connect to the internet. It receives the IP, but still cannot go out. I have tried hard setting both the IP and DNS to that of another laptop in the house (Windows XP laptop works) and still no luck. The wizard to help trouble shoot the problem says it is a DNS problem, but as I said the other XP system is working fine. Any ideas?